For retail jewelers, the holiday season offers tremendous opportunities – for business revenue and for thieves. Crowds, extra inventory and more transactions create an open invitation for shoplifters and employee theft unless jewelers take special precautions, warns Sid Kalantar, Senior Vice President of Sales and Marketing of Senseon™ Secure Access, which provides a keyless, hidden, electronic locking system ideal for jewelry display cases. Retail jewelry theft is rising. Crimes committed against U.S. jewelers reported to the Jewelers’ Security Alliance increased to 1,245 in 2016, up 5.8% from 2015. Dollar losses also rose to $72.4 million, up 4.5%, in that time frame. And violence and guns are becoming more common in jewelry-store robberies. Kalantar said the holidays pose particular challenges for jewelers, including an influx of shoppers and high demand for sales. This can cause sales associates to multitask and become distracted. Moreover, temporary, less-experienced employees hired during the holidays are prime targets for criminals. What can jewelers do to cut down on theft this holiday season? “Take advantage of emerging technologies that make it easier to deter theft,” Kalantar said. He recommended adding smash-proof glass, auto relocking of doors and drawers, and an access control system that eliminates metal keys (avoiding keyholes and key-management issues) and hides locks. Also, for tracking, jewelers can use small radio-frequency identification (RFID) tags and etch information on jewelry. In addition, monitor movement of individual items by particular salespeople – also helpful for boosting productivity. In fact, jewelers may want to take a page from top jewelers that inventory every piece of merchandise at the end of the day and shut down stores if any items are missing. Require associates to serve one customer at a time and show one item at a time. Never let an associate step away from an unlocked fixture. Remove all merchandise from cases overnight. Train temporary employees and remind established employees to always be mindful. Educate temps, especially important for large chain stores, where they are more prevalent. 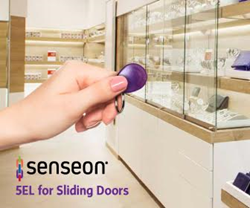 Senseon® Secure Access is the smart successor to the traditional lock and key for cabinetry and casework, ideally suited for retail jewelry stores. This keyless, hidden, electronic secure access locking system uses patented radio-frequency identification (RFID) to provide greater security and efficiency while enhancing the customer experience for increased sales. Jewelers benefit from auto relocking of cases and cabinets, locks four times as strong as traditional locks, and streamlined access management. Senseon is built on patented, proven technology from Accuride® International, a world-leading global designer and manufacturer of movement solutions for businesses, offering over 50 years of experience. Retail Automation Market Worth $19.17 Billion by 2025 | Grand View Research, Inc.